Google Hangouts Meet interoperability service for business and enterprise, in the cloud. Your business doesn’t exist in a silo; so why do your communication tools? With Videxio’s new interoperability service for Google Hangouts Meet, VideoCentric can help you break down barriers and enable your Hangouts Meet users to collaborate with anyone on video – Cisco, Polycom, Microsoft Skype for Business, Lifesize and more. Video Conferencing doesn’t have to be hard. 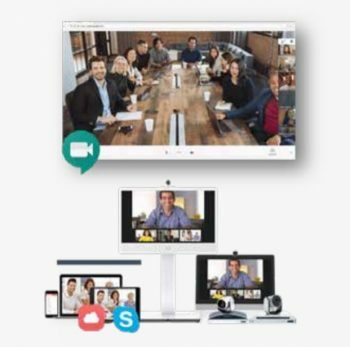 Join meetings with solutions you are already using, or select the best-of-breed solutions for your meeting rooms and connect seamlessly to the Google Hangouts Meet calling environment at the desktop and mobile. Combine SIP and H.323 standards-based devices with Hangouts. Skype for Business with Hangouts. The Pexip and Videxio powered gateway makes interoperability simple, so that all you have to do is schedule a meeting in your calendar. As a Hangout Meets user, the experience you have stays the same. Guests using Skype for Business? Their in-call experience remains how they are used to too. Two-way HD content sharing, meeting scheduling in your own calendar… everyone continues with what they are used to, and if you’re using a professional Video Conferencing system, one-button-to-push makes connecting to the call simple – just join at the touch of a button. Powered by Pexip and Videxio, VideoCentric provide the first cloud-based Video interoperability service for Google Hangouts Meet, the Google G-Suite Video Conferencing service. 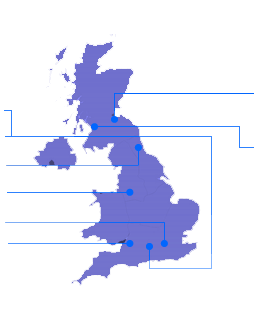 Find out more, arrange a demonstration and get pricing by contacting us, the UK’s fully accredited video integrators, today.